We present various ways to monitor heart function in the larva of Drosophila for assessing questions dealing with the function of gap junctions, ion channel mutations, modulation of pacemaker activity and pharmacological studies. Cooper, A. S., Rymond, K. E., Ward, M. A., Bocook, E. L., Cooper, R. L. Monitoring Heart Function in Larval Drosophila melanogaster for Physiological Studies. J. Vis. Exp. (33), e1596, doi:10.3791/1596 (2009). We present various methods to record cardiac function in the larval Drosophila. The approaches allow heart rate to be measured in unrestrained and restrained whole larvae. For direct control of the environment around the heart another approach utilizes the dissected larvae and removal of the internal organs in order to bathe the heart in desired compounds. The exposed heart also allows membrane potentials to be monitored which can give insight of the ionic currents generated by the myocytes and for electrical conduction along the heart tube. These approaches have various advantages and disadvantages for future experiments that are discussed. The larval heart preparation provides an additional model besides the Drosophila skeletal NMJ to investigate the role of intracellular calcium regulation on cellular function. Learning more about the underlying ionic currents that shape the action potentials in myocytes in various species, one can hope to get a handle on the known ionic dysfunctions associated to specific genes responsible for various diseases in mammals. The cellular mechanisms in the function of the heart for both insects and vertebrates are amazingly similar. Drosophila melanogaster are being used for investigating gene mutations that are responsible for disease states in other animals including humans (Bier and Bodmer, 2004; Peron et al., 2009). Now various diseases are being induced in this tractable genetic organism (Dowse et al., 1995; Johnson et al., 1998; Ganetzky, 2000; Bier and Bodmer, 2004; Ocorr et al., 2007a, b) and with the hope that in time gene therapy can be tested for regain of normal function. In addition Drosophila serve as a good model for physiological function at a cellular level. Many of the past studies on Drosophila heart have been targeted toward developmental aspects in the embryo (Azpiazu and Frasch 1993, Bodmer 1993, Bodmer et al. 1990). A few studies of physiological function occurred in the pre-pupal, pupal or adult stages (Ashton et al., 2001; He and Adler, 2001; Molina and Cripps, 2001; Ponzielli et al., 2002; Sláma and Farkaš, 2005; Wessells and Bodmer, 2004). However the pupal stage is one of metamorphosis and changing hormones as well as fluctuating various biogenic amines. Also the heart is undergoing structural transformation which can prove to be difficult to control for variables when investigating physiology of the myocytes (Dulcis et al. 2005; Johnson et al. 2002; Miller, 1997; Papaefthimiou and Theophilidis, 2001). 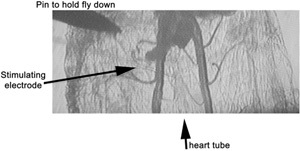 The heart is known to be myogenic in the larval stage and can readily be removed or left in situ while being bathed by a defined physiological saline to limit compounding variables such as circulating hormones or peptides (Dowse et al. 1995; Johnson et al. 1997; Dasari and Cooper, 2006; Feng et al. 2004). The myogenic nature of the larval heart is comparable to the mammalian heart in that there are pacemakers that drive the rest of the heart to pump fluid in a direction to be effective in bathing organs. The chronotropic and ionotropic nature of the Drosophila larval heart is of interest since it could serve as a rapid means to test fundamental principles and pathological effects for mammalian heart function as well as a helping to develop a comparative model for cellular physiology such as ionic regulation of pacemaker cells. The larval heart is very susceptible to biogenic amines and peptides which vary in the hemolymph depending on food source or intrinsic state of the animal (Dasari and Cooper, 2006; Johnson et al. 1997, 2000; Nichols et al. 1999; Zornik et al. 1999). Addressing how endogenous or exogenous compounds influence the heart mechanistically is of interest. Possibly novel insecticides with fewer effects on other organisms can be developed if we gain a better understanding of insect physiology and pharmacology. The cellular mechanism of action of the neurotransmitters and cardiac modulators in larva have not been described to date as there has not been sufficient understanding of the ionic currents and channel types present in the larval heart that contribute and regulate pacemaker activity. As far as we are aware, there are no reports documenting extracellular or intracellular recordings of myocytes to assess ionic currents to address the mechanistic effects of modulators in larval Drosophila. In this report we present various methods to record heart rate and physiological properties of the larval heart. A good means of visualizing a intact beating larval heart is directly with a microscope; however, the larva must remain still enough to count of the contractions. We development methods to monitor heart rate in freely moving larvae as well as restrained larvae. Depending on ones experimental question one approach might be more suitable than other. These approaches could be used to follow an individual over extended periods of time if care is used to avoid dehydration. These methods can also be used to assess pharmacological agents introduced in the diet or to examine various times in development in mutational lines or with induction of heat shock genes. The first unrestrained method we term the 'Ant farm'. This technique consists of two glass plates spaced apart by a thin layer of larvae food. The larvae are able to be visualized within one plane of focus. This technique was also used to monitor by electrical activity circadian movement in larva (Cooper and Cooper, 2004). This technique consists of two glass plates (microscope slides; 75 x 25 mm; J. Melvin Freed Brand) narrowly spaced (1 to 1.5 mm) apart by a thin layer of larvae food (e.g. moist corn meal- a modified version of Lewis, 1960) so that the larvae are able to be visualized within one plane of focus. Spacers commonly used for gel electrophoreses plates (mini gel Bio-Rad; Life Science Research, Hercules, CA 94547, USA) work very well since they can be purchased with varying thickness for use with 1st , 2nd or 3rd instar larvae ant farm procedures. Also an option is to use a solid plastic of a given thickness and cut out the region to use as the crawling space. To prevent larvae from crawling out from the edges of the two plates of the glass a plastic of the desired thickness is used. Slightly tilting the platform at 20 to 45 degrees causes the larvae to remain, the majority of the time, with their head pointed downward and their tail containing the spiracles out above the food or within a air passage in the food layer. This "Ant Farm Technique" also allows video imaging within a single plane with food of uniform thickness. In this configuration the larvae tend not to crawl throughout the food, but instead to eat and gradual move around in the 2D plane. White light is projected from the underside of the microscope stage with a mirror so that it can be moved accordingly for the best contrast of the heart or the two trachea which move while the heart contracts. A microscope (adjustable zoom 0.67 to 4.5; World Precision Instrument; Model 501379) is used. A 2X base objective and tube objective 0.5X is used to gain enough spatial resolution and magnification to cover a 1cm by 0.5 cm rectangle. A mounted camera through a trinocular mount is used (Mintron, MTV; World Precision Instrument). The ambient temperature is maintained at 20°C. Figure 1. Dorsal view of an intact 3rd instar larva. The movement of trachea due to pulling of the attachments from heart is used to observe the heart rate. To monitor the freely moving animal one can place a few drops of a dilute food mixture over the animals head. This should be done in a glass dish so the transmitted light can pass through the larvae for visualizing the heart tube. The same microscopy set up as described above can be used to watch the heart beat and obtain counts. Another approach is to restrain the larva to one location by using double stick tape on a glass slide and placing the ventral side of the larva to the tape (Baker et al., 1999). However this approach does not work well if the tape gets wet when feeding the larvae. To avoid the tape getting wet one can use Vaseline (injected out of a small needle around the base of the larvae and around the tape edge). Here one can feed larva over time without having to chase the larvae into the focus plane or while it is moving on a dish. If one wishes to free the larvae the tape can be moistened and it looses it's adhesiveness to the animal. Take a clean slide and place a cover slip at one end of it. Put a small dab of superglue at one corner of the cover slip. Locate your Drosophila larva and remove it from the test tube. Place the larva in a Petri dish and rinse it with a small amount of water to remove any excess food. Soak up reaming food with the corner of a small tissue or paper towel. Gently pick up larva with tweezers and place it on your slide on the opposite end from your cover slip. Place the slide under the microscope and adjust your lends on the larva. The larva should be on its stomach with its back facing upwards. You can distinguish between the two sides of the larva because their backs feature two 'racing stripes' which are the trachea. The stomach has faint horizontal grooves running along it with very fine black hairs. If the larva is facing the incorrect way, simply turn the right way by gently flipping it over with your tweezers. With a new set of tweezers used specifically for glue take a small dab from the drop at the end of your cover slip and place it at the corner of the opposite end. You should use a fractionally amount of glue; just enough to cover the head of the tweezers. Also, make sure you wipe off the ends of your tweezers so that they do not become glued shut. Under the microscope, double check to make sure the larva is still in the correct position. If it has turned over, see step eight. Now, with the tweezers used to handle larva, pick up the larva and place it gently on the fresh patch of glue. Make sure the black mouth hooks are located near or at the edge of the cover slip and neither they or the brown spiracles come in contact with the glue. Carefully press down on the larva to flatten it out. Now that the larva is in place, you can administer the substances which you wish to test them. This is best accomplished if you use a syringe to draw up the substance and place it in small doses by the larva's head for it to ingest. Finally, the heart rate can be observed by counting the number of pulses of the spiracles in one minute. The preparations are slit along the mid-ventral longitudinal axis and pinned flat. The preparation dish consisted of a glass slide (VWR) with magnetic tape (Best Buys retail out-let) adhered to one side. A hole in the center of the magnetic strip allows the preparation to be viewed with transmitted light. Dissecting pins (Fine Scientific Tools, WA) are bent and glued to paper clips. The paper clips are easily maneuvered on the magnetic tape to hold the filleted preparation in place. This type of recording dish has been previously described for utilization of pinning ganglia isolated from the leech ventral nerve cord (Muller et al., 1981). Place intact 3rd instar larva on dissection plate. Rotate larva on its ventral side until the trachea are no longer visible through the cuticle. Place four pins in the intact larva. Two pins go on either side of the mouth hooks, and two pins go on either side of the spiracles. Add saline, and make a horizontal incision a small distance from the head pins, then continue with a horizontal incision down the length of the longitudinal axis. Stop cutting a short distance from the true heart. Cut around the true heart and along side the spiracles. Lift one dorsal pin and hook it underneath the cuticle. Use the pin to open the body cavity and spread it open. Repeat this with the remaining pins. Remove the guts, being careful not to damage either the trachea or heart. It should be noted that some structures are attached to the heart and can damage it if removed. These include several fat bodies, and the brain. If you can see the heart being stretched while removing the guts, immediately stop attempting to remove that structure. The heart is now exposed and ready for exposure to experimental conditions. Figure 2. Ventral dissection of a 3rd instar to view the heart directly. Pinning of the animal on its back after dissection is used to directly apply the compounds on the heart with or without the CNS intact. 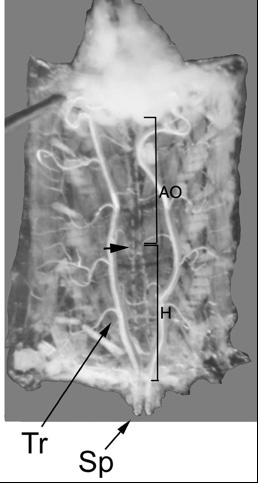 Small arrow indicates where the heart and aorta are separated for transected dorsal vessel studies (see below). Tr, Trachea; Sp, Spiracles; H, Heart; AO, Aorta. This dissection technique has been used to directly assess pharmacological agents on the heart of Drosophila larvae (Gu and Singh, 1995). The dissection time is 3-6 min. The preparation is allowed to relax while bathed in HL3 saline for 3-5 min after dissection. The HL3 saline was carefully controlled to be at pH 7.2 since HR slows at high pH and speeds up at lower pH (Badre et al., 2005). Gu and Singh (1995) used pH 7.0 for the pharmacological analysis of the heart and also showed maintained viability. During these trials the saline remained aerated by agitation of solution through repetitively injecting saline, through a 21-gauge needle, into a beaker. To quantify HR either direct observations can be used or the images can be recorded on to VHS tapes or a digital camera for playback on a screen. A photodiode method has previously been described (Dasari and Cooper, 2006). Place dissected preparation on cover plate. Check temperature inside of bath by floating a temperature probe on a cover plate. When temperature is satisfactory, place preparation and cover plate in bath. Leave preparation in for a desired amount of time and remove when finished. One can use what every heat pulse and temperature required for their experimentation. Fill a focal electrode (approximately 20 microns in diameter) by using a syringe inserted and sealed on the open end and drawing the room temperature (21° C) fly saline (HL3) into the electrode. Mount the electrode into the manipulator, checking that the wire is in the saline inside the electrode and the stimulator is turned off. Place a Drosophila larva 3rd instar larval heart dissected preparation on the dissecting microscope and secure it in place. Place the grounding wire into the saline of the preparation, careful to avoid contact with the pins and sides of the preparation. Use the manipulator to position the tip of the electrode onto the top of the heart, adjusting the focus of the microscope as needed. The best way to achieve this is to focus on the electrode while moving the tip downwards. When the tip is perceived to be in position, the stimulator (model S9 Grass Instruments, Quincy, Massachusetts, USA) should be turned on with the frequency at 2 Hz, duration at 0.5 to 1 ms and voltage on the lowest setting. The delay setting should be between 12 and 14. While observing the heart's rhythm, the frequency should be turned to approximately 3 Hz and the voltage slowly increased until the heart's rhythm seen corresponds to the rhythm produced by the stimulator. Normally the dissected fly heart beats at a frequency of approximately 2 Hz, so when the stimulated rhythm is higher than the intrinsic rate, the heart will be seen, the heart will be seen to beat at a faster rate than normal. Voltage should not surpass approximately 20 V as cell damage can occur at high voltages, making the preparation useless. Typically, one can stimulate the heart between 2 and 8 V, depending on distance and the seal created on the heart. If maximum voltage is reached and no effect is seen, the polarity can be reversed. If this also does not work, the probe should be moved to better establish a connection on the heart. Once a stimulation driven rhythm is established, the rhythm can be manipulated by varying the frequency and duration settings. It should be made known, however, that frequencies above 4 Hz can put the heart into tetany. Various alcohols and pharmacological agents can be added and their effect on gap junctions can be observed once the desired rhythm is established. Blocked gap junctions do not conduct a current and the propagated rhythm will cease. Please click here to see a larger version of this figure. Glass electrodes are made from Kimax glass (outer diameter: 1.5 mm). The glass tube is pulled and fire-polished to produce patch tips with inside diameters ranging from 10 to 20 μm. The lumen of the electrode is filled with the bathing medium. The amplifier and recording on line to a computer is the same as that used below for the intracellular recordings. The lumen of a 'macro-patch' recording electrode (Stühmer et al.,1983) is placed directly over a region of the heart. The spontaneous pacing of the muscle fibers produce a field potential that can be monitored with the focal electrode. Care needs to be given by gently lowering the lumen and raising it over each region of the heart to be monitored. The potentials are recorded through a macro-patch electrode. Direct counting of heart rate and monitoring electrical events is possible. Altering the bathing media while recording these potentials is also feasible to asses the effects on the field potentials. To monitor the transmembrane potentials of the myocytes a region of heart is impaled with sharp intracellular electrode (20 to 30 mOhm resistance) filled with 3 M KCl. 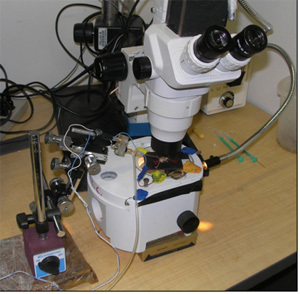 A standard head stage and amplifier for intracellular recording can be used; however we used a model Axonclamp 2B (Molecular Devices, Sunnyvale, CA, USA) amplifier and 1 X LU head stage. It appears that the caudal end of the heart is more rigid and this is where the pacemaker cells reside since contraction initiates in this region the majority of the time (Badre et al., 2005; Dasari and Cooper 2006; Dasari et al., 2007). Funding provided by the G. Ribble Fellowships in the Dept of Biology, the Kentucky Young Researchers and Undergraduate Education-eUreKa! Office (Univ. of KY). Dissecting microscope with zoom function for dissection and counting heart rate. For focal stimulation of the heart this is needed as well. For extracellular and intracellular recordings a compound microscope with upright objectives (4 x and 20X) is used. Standard intracellular amplifier and A/D board for on line recording to a computer. Electrical signals are recorded on line to a PowerLab/4s interface (ADInstruments, Australia). We use standard software from ADInstruments named Chart or Scope. Chemicals: All saline chemicals are obtained from Sigma chemical company (St. Louis, MO). For intracellular recordings we use glass capillary tubing (catalogue # 30-31-0 from FHC, Brunswick, ME, 04011, USA) and for focal macropatch recording and stimulating electrodes we use Kimax-51, Kimble Products Art. No. 34502, ID 0.8-1.1mm, length 100mm. The intracellular electrode should have a resistance of 20 to 30 mOhm. The macropatch electrode is constructed by breaking off the tip of the glass after a fine tip was made from an electrode puller. The broken off tip needs to be a clean perpendicular break about 20μM in diameter. The tip is then heat polished to about 10μM inner diameter for the focal extracellular recording. For the stimulating electrode to drive the heart we use a final tip of about 20-50 μM in diameter. The shaft of the electrode is run over a heating element to cause it to bend about 45 degrees with a gradual bend. This produces a flat or perpendicular electrode lumen over the heart tube as the angle with the micro-manipulator will produce about another 45 degrees to the preparation. Ashton, K., Wagoner, A. P., Carrillo, R., Gibson, G. Quantitative trait loci for the monoamine-related traits heart rate and headless behavior in Drosophila melanogaster. Genetics. 157, 283-294 (2001). Azpiazu, N., Frasch, M. Tinman and Bagpipe: Two homeo box genes that determine cell fates in the dorsal mesoderm of Drosophila. Genes & Development. 7, 1325-1340 (1993). Badre, N. H., Martin, M. E., Cooper, R. L. The physiological and behavioral effects of carbon dioxide on Drosophila melanogaster larvae. Comp Biochem Physiol A Mol Integr Physiol. 140, 363-376 (2005). Baker, J. D., McNabb, S. L., Truman, J. W. The hormonal coordination of behavior and physiology at adult ecdysis in Drosophila melanogaster. J. Exp. Biol. 202, 3037-3048 (1999). Bier, E., Bodmer, R. Drosophila, an emerging model for cardiac disease. Gene. 342, 1-11 (2004). Bodmer, R. The gene tinman is required for specification of the heart and visceral muscles in Drosophila. Development. 118, 719-729 (1993). Bodmer, R., Jan, L. Y., Jan, Y. N. A new homeobox-containing gene, msh-2, is transiently expressed early during mesoderm formation of Drosophila. Development. 110, 661-669 (1990). Cooper, A. S., Cooper, R. L. Monitoring activity of Drosophila larvae: Impedance & video microscopy measures. Drosophila Information Service. 87, 85-87 (2004). Dasari, S., Cooper, R. L. Direct influence of serotonin on the larval heart of Drosophila melanogaster. J. Comp. Physiol. B. 176, 349-357 (2006). Dasari, S., Viele, K., Turner, A. C., Cooper, R. L. Influence of p-CPA and MDMA on physiology, development and behavior in Drosophila melanogaster. European J. Neurosci. 26, 424-438 (2007). Dowse, H., Ringo, J., Power, J., Johnson, E., Kinney, K., White, L. A congenital heart defect in Drosophila caused by an action-potential mutation. J. Neurogenetics. 10, 153-168 (1995). Dulcis, D., Levine, R. B. Glutamatergic innervation of the heart initiates retrograde contractions in adult Drosophila melanogaster. J. Neurosci. 25, 271-280 (2005). Feng, Y., Ueda, A., Wu, C. F. A modified minimal hemolymph-like solution, HL3.1, for physiological recordings at the neuromuscular junctions of normal and mutant Drosophila larvae. J. Neurogenetics. 18, 377-402 (2004). Ganetzky, B. Genetic analysis of ion channel dysfunction in Drosophila. Kidney International. 3, 766-771 (2000). GG, G. u Pharmacological analysis of heartbeat in. Drosophila. J. Neurobiol. 28, 269-280 (1995). He, B., Adler, P. N. Cellular mechanisms in the development of the Drosophila arista. Mechanisms of Development. 104, 69-78 (2001). Johnson, E., Ringo, J., Dowse, H. Modulation of Drosophila heartbeat by neurotransmitters. J. Comp. Physiol. B. 167, 89-97 (1997). Johnson, E., Ringo, J., Bray, N., Dowse, H. Genetic and pharmacological identification of ion channels central to the Drosophila cardiac pacemaker. J. Neurogenetics. 12, 1-24 (1998). Johnson, E., Ringo, J., Dowse, H. Native and heterologous neuropeptides are cardioactive in Drosophila melanogaster. J. Insect Physiol. 1, 1229-1236 (2000). Johnson, E., Sherry, T., Ringo, J., Dowse, H. Modulation of the cardiac pacemaker of Drosophila: cellular mechanisms. J. Comp. Physiol. B, Biochem., Systemic, Environmental Physiol. 172, 227-236 (2002). Lewis, E. B. A new standard food medium. Drosophila Inform. Serv. 34, 117-117 (1960). Miller, T. A. Control of circulation in insects. General Pharmacol. 29, 23-38 (1997). Molina, M. R., Cripps, R. M. Ostia, the inflow tracts of the Drosophila heart, develop from a genetically distinct subset of cardial cells. Mechanisms of Development. 118, 51-59 (2001). 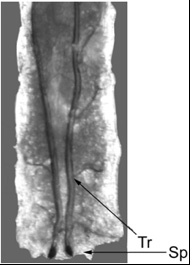 Muller, K. J., Nicholls, J. G., Stent, G. S. Neurobiology of the Leech. Cold Spring Harbor Laboratory. Cold Spring Harbor, New York. 254-254 (1981). Nichols, R., Kaminski, S., Walling, E., Zornik, E. Regulating the activity of a cardioacceleratory peptide. Peptides. 20, 1153-1158 (1999). Ocorr, K., Akasaka, T., Bodmer, R. Age-related cardiac disease model of Drosophila. Mechanisms of Ageing and Development. 128, 112-116 (2007a). Ocorr, K. A., Crawley, T., Gibson, G., Bodmer, R. Genetic variation for cardiac dysfunction in Drosophila. PLoS ONE. 2, e601-e601 (2007). Papaefthmiou, C., Theophilidis, G. An in vitro method for recording the electrical activity of the isolated heart of the adult Drosophila melanogaster. In Vitro Cellular & Developmental Biol. Animal. 37, 445-449 (2001). Peron, S., Zordan, M. A., Magnabosco, A., Reggiani, C., Megighian, A. From action potential to contraction: Neural control and excitation-contraction coupling in larval muscles of Drosophila. Comp. Biochem.Physiol. A: Molecular & Integrative Physiol. 154, 173-183 (2009). Ponzielli, R., Astier, M., Chartier, A., Gallet, A., Therond, P., Semeriva, M. Heart tube patterning in Drosophila requires integration of axial and segmental information provided by the Bithorax Complex genes and hedgehog signaling. Develop. 129, 4509-4521 (2002). Sl ma, K., Farkas, R. Heartbeat patterns during the postembryonic development of Drosophila melanogaster. J. Insect Physiol. 51, 489-503 (2005). St hmer, W., Roberts, W. S., Almers, W. Single channel recordings. Sakmann, B., Neher, E. The loose patch clamp, Plenum Press. New York. 123-132 (1983). Wessells, R. J., Bodmer, R. Screening assays for heart function mutants in Drosophila. Biotechniques. 37, 58-66 (2004). Zornik, E., Paisley, K., Nichols, R. Neural transmitters and a peptide modulate Drosophila heart rate. Peptides. 20, 45-51 (1999).